All our riders will receive a quality cycle shirt to spur them on their way as they pedal for a cause while having fun and enjoying support along the route. Cost: R800 NON-REFUNDABLE entry fee payable on ENTRY + R1000 payable by the 4th of February 2019. Enter your details below. If you are entering more than one person, please submit each person’s details separately. • Once you have completed step 1 above, further printable instructions will appear on your screen. 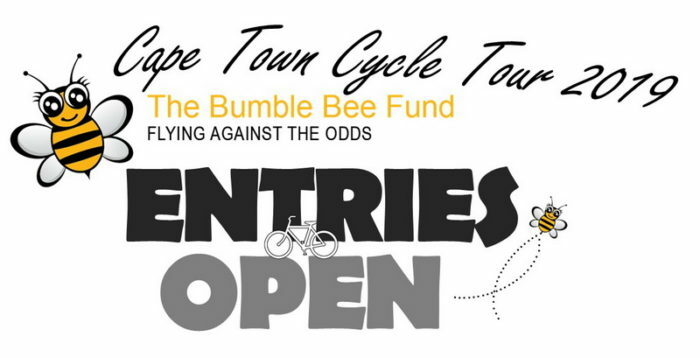 On this screen you will find the link to enter yourself into Cape Town Cycle Tour 2019 as a Bumble Bee Rider via the Cycle Tours online entry platform. Included in these instructions will be our banking details for the NON- REFUNDABLE entry fee payment of R800. • Once we have confirmed receipt of your entry fee you will be e-mailed a raffle sheet to help you raise the R1000 for our beneficiaries. Just sell the 20 raffle tickets @ R50 each to friends and family and eft your R1000 by the 4th of February 2019. We have a limited number of entries and expect to sell out quickly so don’t delay. It would be awesome to have you on board as a BBF rider. Kids make a difference by entering the Junior Cape Town Cycle Tour and cycling for the Bumble Bee Fund! © 2019 The Bumble Bee Fund. Website designed and hosted by Personalised Promotions. Sitemap.